Home page offers tree options - Catering, Summary, Sale. 4. Content page - here you can Download Flight content, Upload sales data to Inflight+ or remove selected Carrier and select another one. 6. Now you have 1 Downloaded flight content and you can continue to load several others, if you need. 7. If you had all flights loaded to app > Go back to Home page by icon "Back"
Here you go straight to select flight and sale products. 1. Sign in with your Crew ID and PIN. If you already signed in with Microsoft account (in Catering page), you will be logged automatically. MS account has to be assigned to Crew ID in Inflight+ application. 3. Sale product by taping on it > Yes. You can add more products. 4. Finish sale by "Basket" icon . This icon appears after you add first product to basket. 7. Bill - Now you see the summary of sale - Total, Paid, Returned amount. 8. Go to the new Sale by and repeat points 3. - 7. 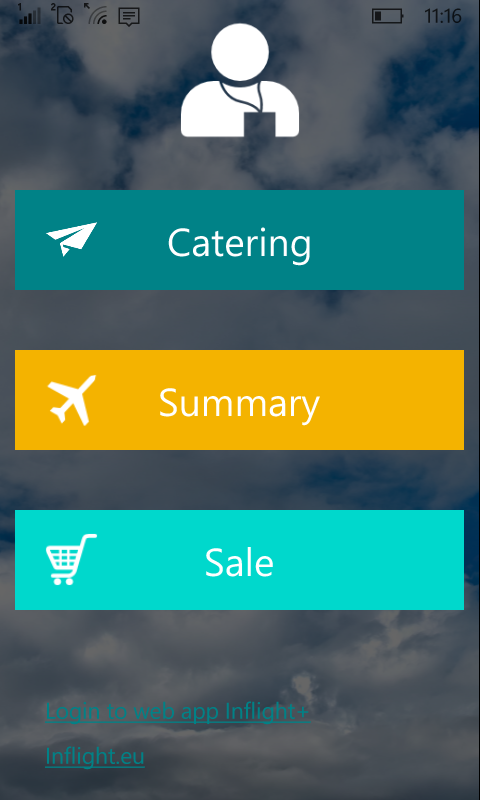 End of flight - Send flight sales data to Summary. This is possible only after the output Inventory is created. After making Inventory and finishing flight, you see all results in Summary.